Kingstonâ€™s DataTravelerÂ® 2000 is designed to be secure, with an alphanumeric keypad that locks the drive with a word or number combination, for easy-to-use PIN protection. DT2000 features hardware-based, full-disk AES 256-bit data encryption in XTS mode. 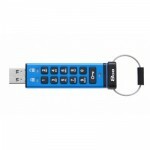 Encryption is performed on the drive and no trace of the PIN is left on the system. Itâ€™s FIPS 197 certified, to meet a frequently requested corporate IT requirement. KingstonÂ® DataTravelerÂ® 2000 uses DataLockÂ® Technology licensed from ClevX, LLC.